Hey everyone and welcome back to another awesome Tasty Tuesday post! Want to start the semester with a kick? 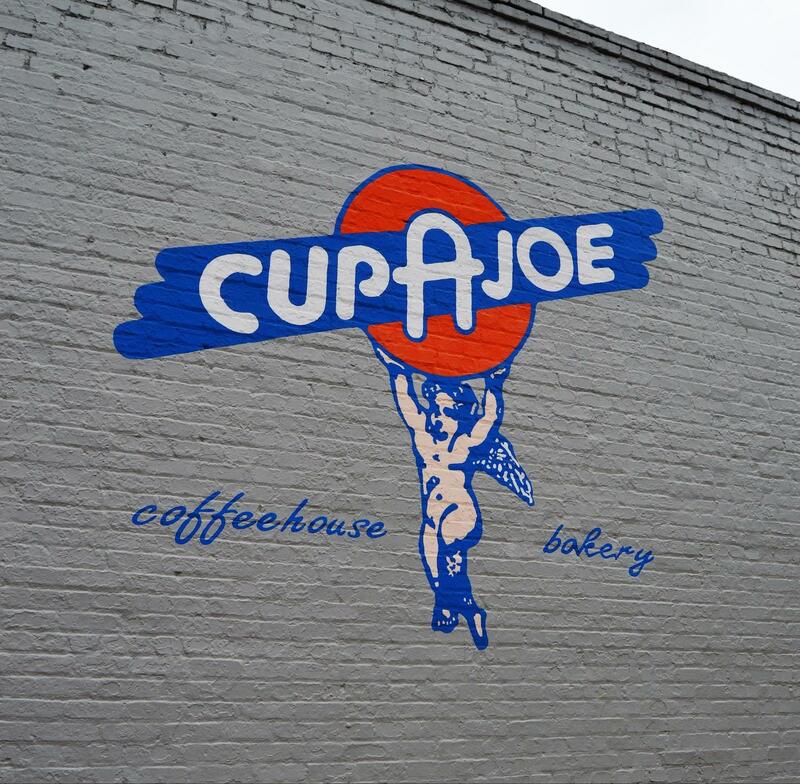 This week we visited the popular coffee shop here on Hillsborough St., Cup A Joe! This little shop is one of the oldest and notorious coffee shops here in Raleigh! They serve a variety of coffee drinks from around the world as well as homemade baked goods. As you walk inside you’ll notice the quirky layout that gives it that ol’ timey coffee shop charm. You’ll also be greeted by the wonderful staff. I wasn’t fairly familiar with the menu so the barista pointed out their joe juices as some of their popular items. In regards to pastries she pointed out that their crumb cake is a winner and sells out fast. 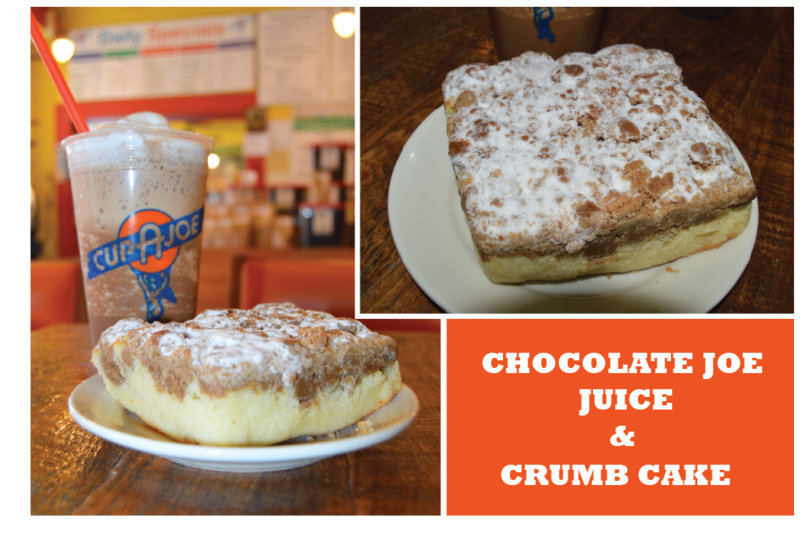 I took my chances and went for the Chocolate Joe Juice, crumb cake, and cherry cheese danish, and boy was I happy. After a taste of the crumb cake, I can see why it’s their most popular pastry. As you bite into it, the top layer is nice & dense and flaky with the perfect coat of powdered sugar. Once you reach the bottom it’s so moist and fluffy it made my taste buds sing. Now I’m a fan of pastries and I’ve had my share of crumb cakes in the past, but this one tops them all. The fineness of this cake is exquisite and for the price you get a large chunk that can easily feed 2 people. Frankly I couldn’t get past ⅓ of it! Onto the Chocolate Joe Juice! There was a Tuesday special on this one and for the price of $3.25 I got their largest size! Now that’s a cheap price for coffee! I will say I’m not a fan of coffee, but this one tasted more like chocolate milk with a subtle coffee taste. It was nice and rich in flavor. I highly recommend this one for non-coffee lovers. As for the strength of this drink, let’s just say I didn’t sleep a wink that night. Lastly I purchased one of the cherry cheese danishes. This one was also delicious as it had a slight crunch with every bite. There was a nice balance of cherry marmalade and cream cheese along with a generous icing drizzle. If you’re ready to start your day bright and early, then I highly recommend stopping by Cup A Joe for a nice cup of coffee and maybe a snack on the go. I know I’ll be making frequent visits once I start this semester! Monday - Friday : 6:00 a.m. - 9:00 p.m.